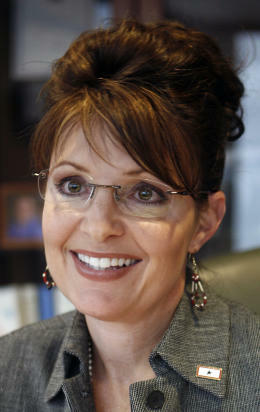 John McCain has announced his Vice Presidential running mate and it is power WOMAN, Sarah Palin, Governor of Alaska. Now, tell me that this lady does not look like one of your best friends. I usually do not explicitly express my political views on this sight because it really is about the music, BUT…I generally try to weave the music into current day happenings. And, for women in America today, this is a HUGE happening. This is only the second time a woman has been nominated for VP and the first time that a woman has a LEGITIMATE shot at being Vice President. I’ll admit that I’m not a huge McCain fan. While I admire his service to our country, his “maverick” streak of independence, and his stubborness against conforming to the norm, there’s just always been something a little standoffish about the man. However, today Mr. McCain showed his progressiveness, open-mindedness and respect for smart people. She is the daughter of two teachers who left Idaho to teach in Alaska in the mid ’60s. She has FIVE, count ’em, FIVE children ranging in age from 19 to 4 months. Her oldest son, Track, is in the U.S. Army and will deploy to Iraq this month. Cool kids names: Track, Bristol, Willow, Piper and Trig. She surprised everyone in late February, announcing that she was SEVEN MONTHS pregnant with her 5th child. That child was born with Downs Syndrome. She went back to work THREE days after giving birth. She’s an avid hunter who used to go moose hunting before school. She recently posed in a photo spread in Vogue. She has a remarkable resemblence to Tina Fey. In other words, don’t waste my time with a “token woman” position….if you ain’t serious, I’ll just stay here and get some real work done. This is a new day, a new opportunity. Finally, a peer of my own generation who I can actually relate to is in the mix. Bravo!, Mr. McCain for having the cahonas to do what many folks give lip service to. As a mother, working woman, and wife, Sarah Palin certainly has a grasp of the issues that we are all facing and the ones that are most important. Her unique understanding of the war in Iraq, education challenges and the complexities of the oil issue will truly provide the McCain ticket with a hard-working, contributing partner and not just a figure head. However, it’s the understanding of having a handicap child that really resonates with me. This kind of situation puts many issues into perspective. Having a handicapped sibling and mother, I learned early on that you become much more pragmatic and tend to stay calm in the face of trying times. A friend of mine is fond of the saying, “God is preparing you for greatness”, when things are particularly tough and perhaps that’s exactly what has happend to Mrs. Palin. Intelligence and Compassion, Fortitude and Grace. All critical ingredients for a leader.